Through individual home instruction, the goal for all children in the program is to become as independent and self-sufficient as they can. Our occupational therapists, working with the parents, teach our children the basics from feeding and dressing skills to dealing with sensory integration and learning to play. The Elks physical therapists evaluate and treat children with a wide range of disabilities as they travel from home to home. Their focus is to help these children learn or improve important motor skills by educating or re-educating muscles and increase strength, endurance and coordination. Parent involvement helps increase the rate of success. The gift of communication, the promise of the future – with thanks to the Elks. Our highly trained Elks Major Project speech-language pathologists can diagnose a variety of communication disorders and coordinate a home program of therapy with the parent. Many speech-language problems are addressed by the staff, including swallowing or feeding difficulties. 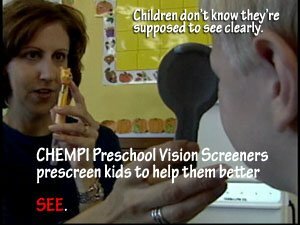 Preschool Vision Screeners travel from school to school to test kids for any kind of visual problems, from mild to severe. Kids whose vision problems are treated early on have a much better chance of seeing clearly through their lives…and without CHEMPI to screen them for early signs they could simply and literally go blind.